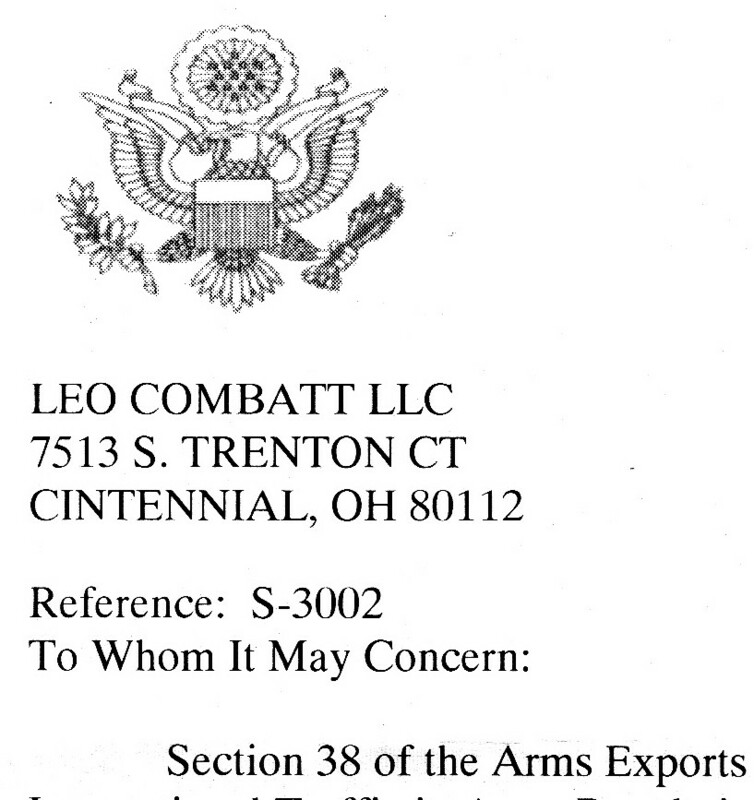 So A Fight It Is, Then: Leo Combat LLC v. U.S. State Dept. Yes, that’s an extra “T.” Also, “Cintennial, OH” is probably a ways from Centennial, CO. But maybe for $2,250 they’ll correct it. UPDATE: the lawsuit is filed, and all information is conveniently collected on the lawsuit page. If you want to help out, buy a gift certificate! The State Department has sent me another threatening letter demanding that I contact them within 30 days. I checked my phone bill, and I’ve contacted them 11 times between these two letters, so far without them bothering to call me back. I left a sarcastic message that will be just as ignored as the earnest ones have been. My congressional delegation has not uttered a peep in response to my requests for help in dealing with this issue. Not even a “Sorry I can’t help you” letter. I was really hoping maybe they could do something because a lawsuit is a HUGE waste of time and energy and brainpower and money. I have been holding off and hoping I could find another way. There is no choice; a lawsuit it is. I will post all documents related to the case here for anyone to read (they will be boring). And I will sell gift certificates to anyone who wants to help me fight the bureaucrats so that I–and other small domestic gun and ammo makers–can go about our business without being hassled by an export-control pencil-pushers. In case you were curious what the issue is, in 2004 you had to pay $600 to register with the Directorate of Defense Trade Controls (State Dept.) 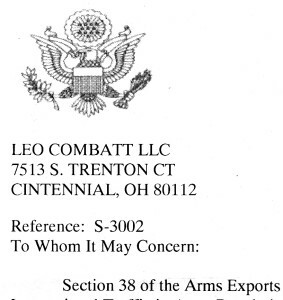 as a manufacturer of “defense articles,” whether or not you exported them. In 2006 they raised that to $1,750, and then in 2008, to $2,250. I want to emphasize, that is the price of NOT exporting. Exporters pay more based on how many licenses they seek. It’s ludicrous, but a lawsuit is more expensive, so most people either pay or quietly commit a felony hoping not to be noticed. I just want to make guns, not fight in court, but I can’t abide what is both a huge drag on small business AND an unchallenged way for any hostile administration to attack our Second Amendment rights by jacking up fees to the sky. You want a response? Fine. See you in court.